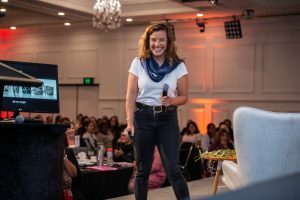 Alison Page presented at Strong Women Strong Business Conference in May 2018. “It was a pump your fist in the air moment!” said Alison Page about the Strong Women Strong Business Conference. Alison and IBA’s Stella de Cos talked to Nyunggai Warren Mundine AO on Mundine Means Business about the conference and how important it is to bring together the strength of our Indigenous women in Australia. The network highlighted the need for a mentoring platform and IBA is soon to deliver on that promise in the coming weeks – stay tuned! Watch the broadcast now or visit the website to find out more information on strongwomenstrongbusiness.com.